Truth and individual freedom. Freedom of expression. Creativity, love and respect for all things. Freedom for an individual to make a choice - sexually, spiritually and socially. The right to be different and still belong. Honor in refusing to fight without judging those who did. Our right to make a difference. Our right to think independently. Our willingness to share with others. 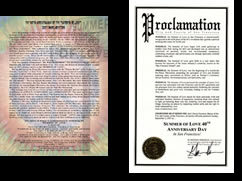 Summer of Love 40th Anniversary - 2007! 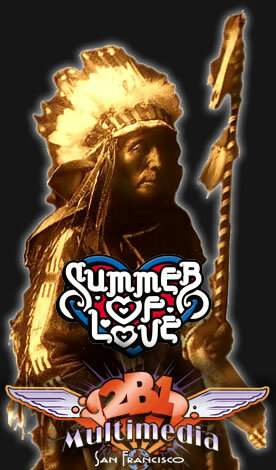 Summer of Love 40th" 2 DVD/ 2 CD set. We are taking orders now !!! Their is a limited supply so get your order in early. The Collector set includes 2 DVD's and 2 CD's of the highlights of the event for $20 (store price is $29.95) shipping included. We will begin shipping all orders from January 20th on. Please include with your payment a note with your name and address stating you are purchasing the "Summer of Love 40th Collectors Addition". If you wish you can call us directly at 2b1, 415 861-1520. NOTE: Internet stream radio interview with Boots Hughston coordinator of Summer of Love 40th Anniversary, on Thursday, August 16, 2007, 7 PM (PST) 10 PM (EST) ArtistFirst Radio Network. You can tune in to anywhere from your PC. Chet Helms had a magical ability to bring people together, the 60's was an incredible time for music, the San Francisco music scene exploded on the world platform as the place to be. Bill Graham and Chet Helms were both very intuitive and had the chemistry that helped change the world of music. Little did we all know that the majority of bands that came out of the S.F. Bay Area at that time would be a part of musical history. The Summer of Love was Chet's labor of love for the people, everyone really loved and respected Chet as i do. People from every corner of the globe flocked here, the energy and vibe was geared for all to be who they be and be free of the injustices and stereotypes that plague our society, When Sly and The Family Stone came onto the music scene people were ready for our music. We took the world by storm, as we touched the hearts of millions of "everyday people". And to this day our legacy continues to live on. Please let the people know that Sly and the Family Stone would have loved to perform at the 40th Anniversary for the Summer of Love..
"When we wind up, We only find up, not down" In my world "EVERYBODY IS A STAR". Many more artists are currently in discussion for appearances at the event. We are not able to pre-announce certain San Francisco heritage musicians that may have been listed previously due to their having other gigs within the usual 60-mile/60-day blackout areas.